The Alaska Track of the UW-Seattle Children’s pediatric residency program has graduated its first group of new physicians. The four young doctors had spent four months out of each of the past three year in Alaska, where they worked with community pediatricians and other health professionals. Their clinical instructors practice in Fairbanks and Anchorage, and in the rural town of Bethel. They also travel to see patients in remote bush villages in areas not connected by highways or ferries, and Arctic tundra towns like Nome. The residents split their time between private clinics and the Alaska Native health care system. The remainder of their training was in Washington state, alongside their peers in the Seattle pediatrics residency. 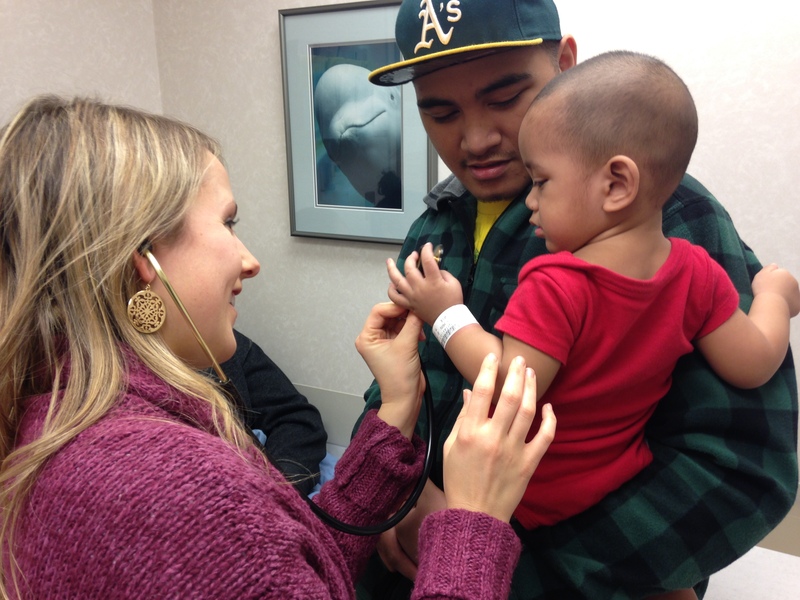 Alaska Track pediatrics resident Dr. Brooke Jardine examines a baby in Tanana Valley Clinic. Residents in the track experience first-hand what it is like to be a primary-care pediatrician in the most northerly reaches of the United States. The nation’s largest, most sparsely settled state has a chronic shortage of physicians generally. Along with Idaho and Wyoming, Alaska ranks near the bottom in the United States in its pediatrician to child ratio. Each summer, a new group of four pediatric residents enter the Alaska track. By staggering when the first-, second-, and third-year participants are in Alaska, the training sites now have residents on their medical teams all year round. The newly graduated Alaska track residents are Drs. Theresa Dulski, Eric Foote, Patti Clay and John Hawes. Originally from Illinois, Dulski’s attachment to Alaska grew during each rotation. As the end of her residency approached, she accepted a position to practice in Anchorage. Out of concern about dental disease in young Alaskans, Dulski worked with Cavity Free by Three. She helped implement profluoride varnishes at the Tanana Valley Pediatric Clinic in Fairbanks. The prevention effort spread across the state. Current resident Dr. Matt Serna has trained at both LaTouche Pediatrics in Anchorage and the tribally owned Yukon-Kuskokwim Delta Regional Hospital in Bethel and its outlying clinics. When kids from the bush come into the hospital, he said, the staff not only checks out their current medical problem, but also address everything they can – immunizations, hearing, their social situation – because they don’t know when the child might have access to care again. Serna described being weathered in when he and a pediatrician headed to Toksook Bay at the mouth of the Kuskokwim. When they landed the next day, they learned that the local physician assistant had left for another village to treat a pregnant woman with a history of severe bleeding after previous births. The small village didn’t have blood supplies, just intravenous fluids. They got the woman on a flight to Bethel and delivered her 30 minutes after landing. If they hadn’t been any flights coming in or out, they would have had to sail across. Clockwise from top left: Matt Serna, Emily Hogeland, Beth Little and Brooke Jardine. pictures of Alaska residents Matt Serna, Emily Hogeland, Beth Little and Brooke Jardine. Several residents mentioned that primary-care pediatricians in Alaska often have to manage situations that, in most Lower 48 cities, would be in the realm of specialists. Current resident Dr. Emily Hogeland helped stabilize a premature, 1.5-pound newborn in Fairbanks for six hours while awaiting a plane to bring the infant to Anchorage. In Seattle, she said, a neonatologist would have been there for a baby that small. Her colleague, resident Dr. Beth Little, had the chance to work with village health aides, who provide first-line care for common problems. Resident Dr. Brooke Jardine added that, when offering medical advice to parents on their child’s home care, doctors need to keep in mind that conditions in some Alaskan villages are austere. Some don’t have running water or electricity. “We can’t assume anything,” Little agreed. “Not even what transportation a patient might use to get back home. It might be a boat, a float plane or a snowmobile. We also have to check our assumptions on how we treat diseases.” For example, she said that sepsis – a potentially life-threatening blood infection—is higher among some Alaskan babies. Physicians watch more carefully for it, even among slightly older infants. The residents participate in the wide range of services rural pediatricians provide, from the first hour of life through the teen years, from well-child visits to managing many types of chronic, emergent or serious conditions. The Alaska Track is a possible model for residencies in other fields facing shortages of rural physicians. The idea originated with the chair of the department, Dr. Bruder Stapleton, in collaboration with several colleagues in Seattle, Alaska and the regionalized program of the UW School of Medicine known as WWAMI, for Washington, Wyoming, Alaska, Montana and Idaho. Dr. Christine Tan and Dr. Amy Schumacher are the Anchorage program directors for the Alaska track.